April 10, 1932: Frances (Judy) performed in a talent show at the Lancaster High School, Lancaster, California. 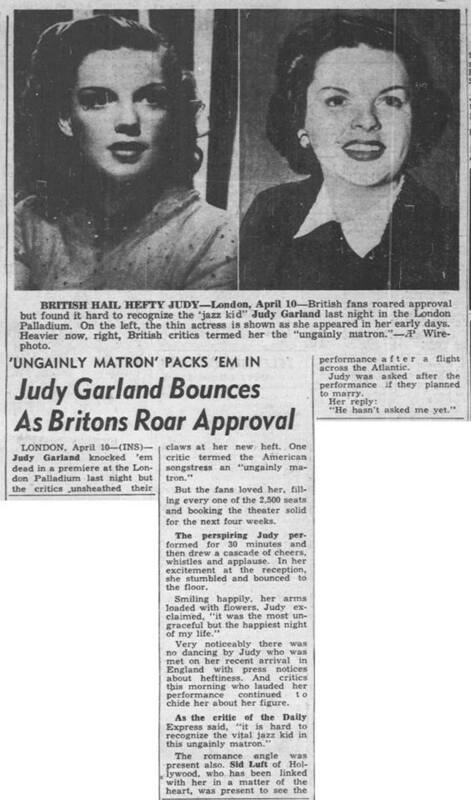 April 10, 1939: Judy’s first night at Loew’s in New York. 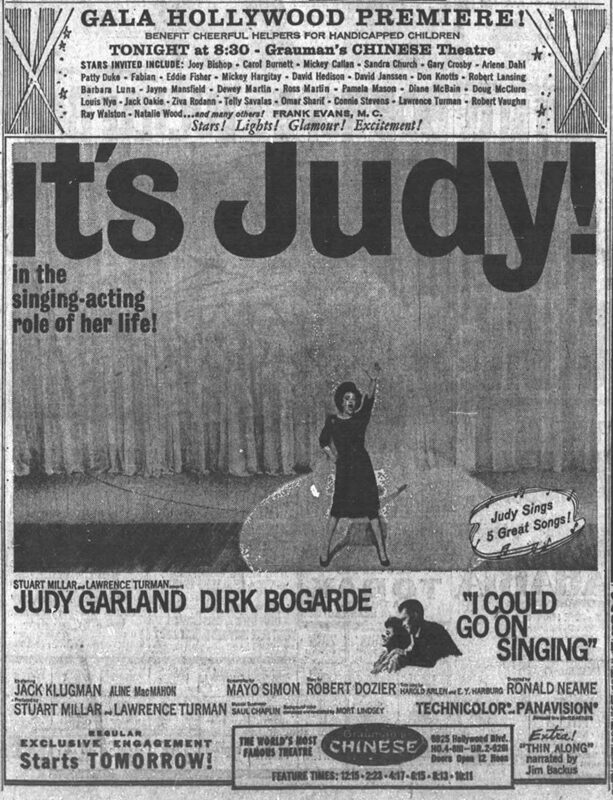 According to the papers, Judy made appearances at multiple Loew’s theaters each night (see the ad above). 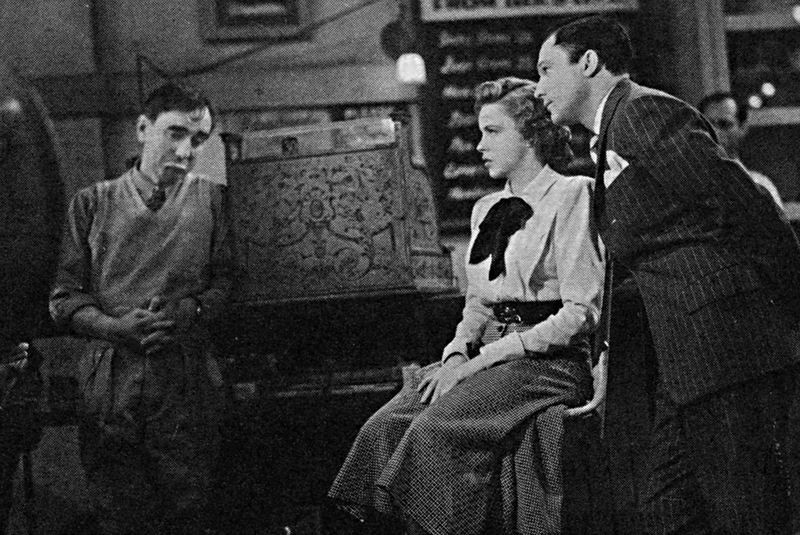 In one instance it was noted that when Judy played the New Jersey theater, she was “forced to appear in the lobby at the demand of her fans.” Due to the times given and taking into account the time to travel, Judy’s appearances at the smaller Loew’s theaters must not have included a show but rather the greeting of fans. 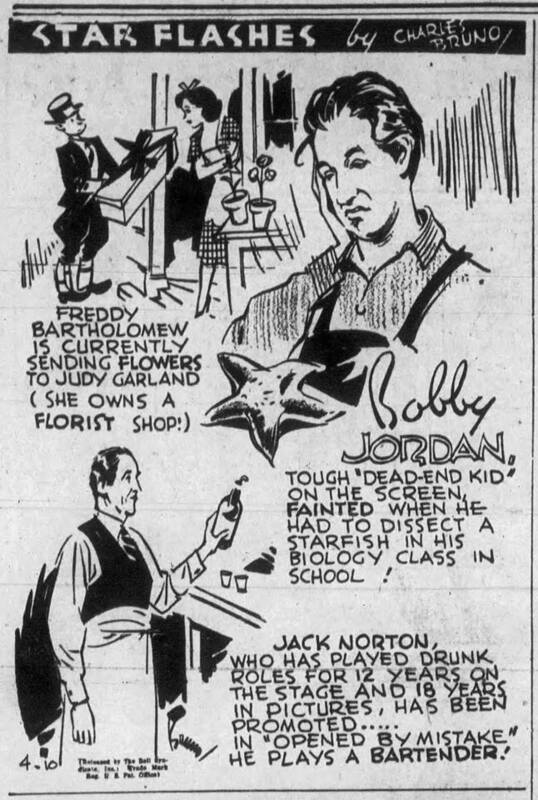 April 10, 1940: Here’s a cute cartoon that mentions Judy and Freddie Bartholomew, as well as Judy’s flower shop (which was a reality, at least for a while). Also on April 10, 1940: Decca Records recording session at the Decca studios in Hollywood, California. 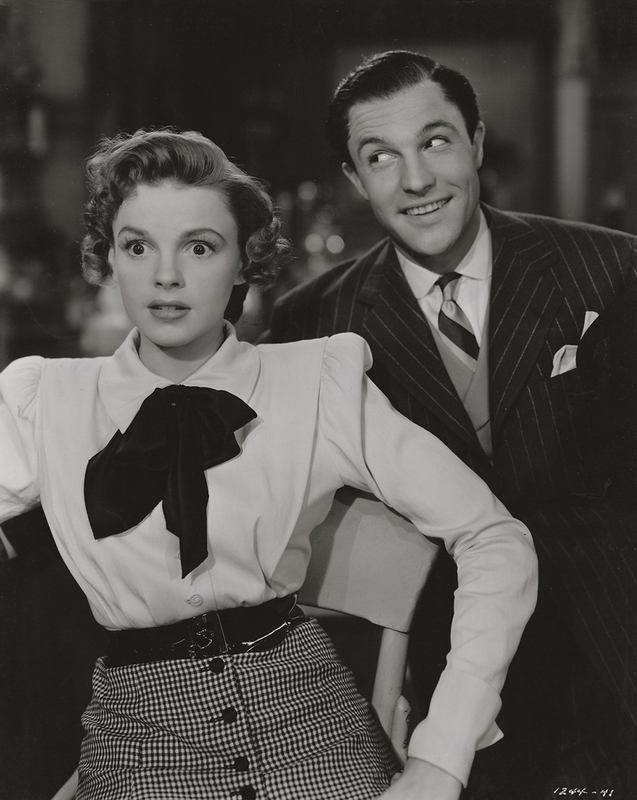 Judy recorded four songs in the following order: “(Can This Be) The End Of The Rainbow”; “Wearing Of The Green”; “I’m Nobody’s Baby”; and “Buds Won’t Bud.” The latter two were also recorded by Judy for MGM’s Andy Hardy Meets Debutante with “Buds Won’t Bud” being deleted. “I’m Nobody’s Baby” was the highlight of the film and this Decca recording (paired with “Buds Won’t Bud” on Decca single #3174) was released by Decca to coincide with the release of the film. What’s interesting is that “I’m Nobody’s Baby” was the “B” side of the single, but is the song that became the hit, peaking at #3 on the charts. “Wearing of the Green” was not released until August and was paired with “Friendship” which Judy recorded with Johnny Mercer on April 15th. “(Can This Be) The End Of The Rainbow” was released in September of 1940 and then again in November 1941. 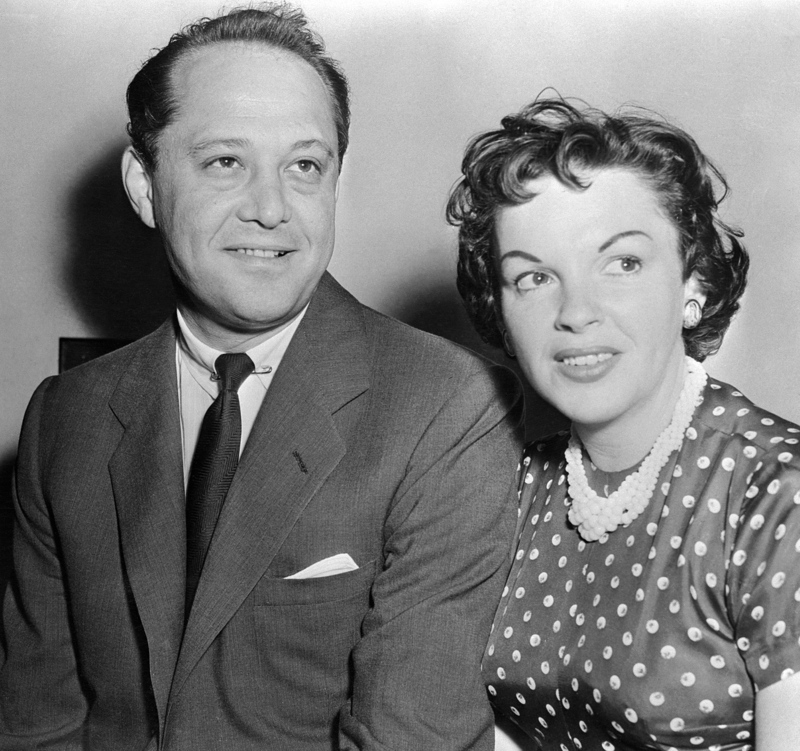 For information about all of Judy’s Decca recordings and their many, many re-releases, check out The Judy Garland Online Discography’s Decca Records Pages here. 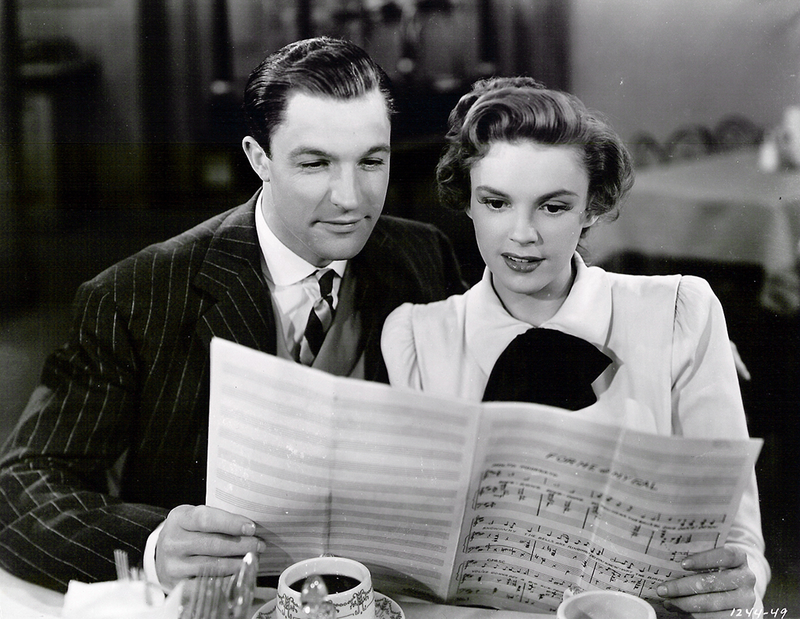 April 10, 1942: Filming continued on For Me And My Gal on the “Interior Nick’s Cafe” set. Tie called: 10:00 a.m.; dismissed: 6:15 p.m. this was the last day of filming the iconic title number. 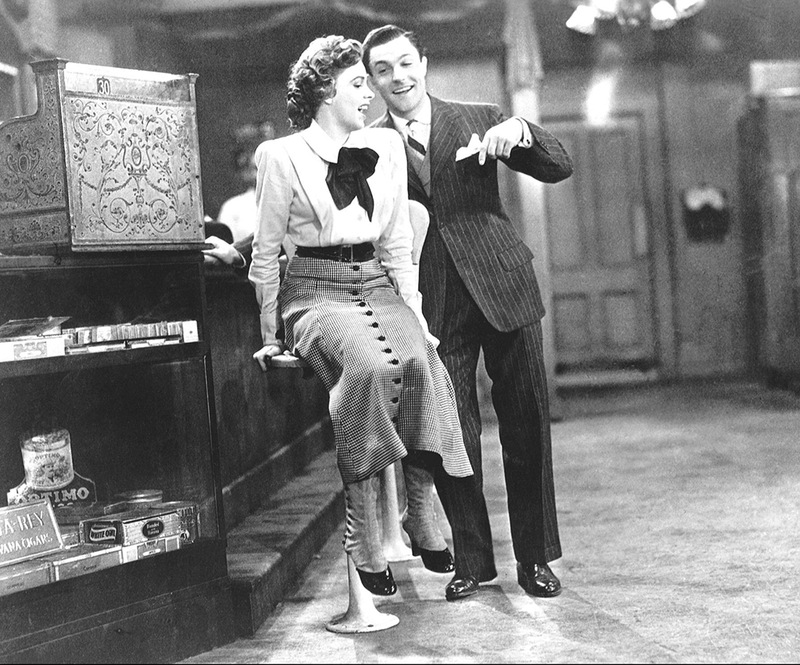 April 10, 1943: Judy had another music rehearsal of the “Embraceable You” number for Girl Crazy. 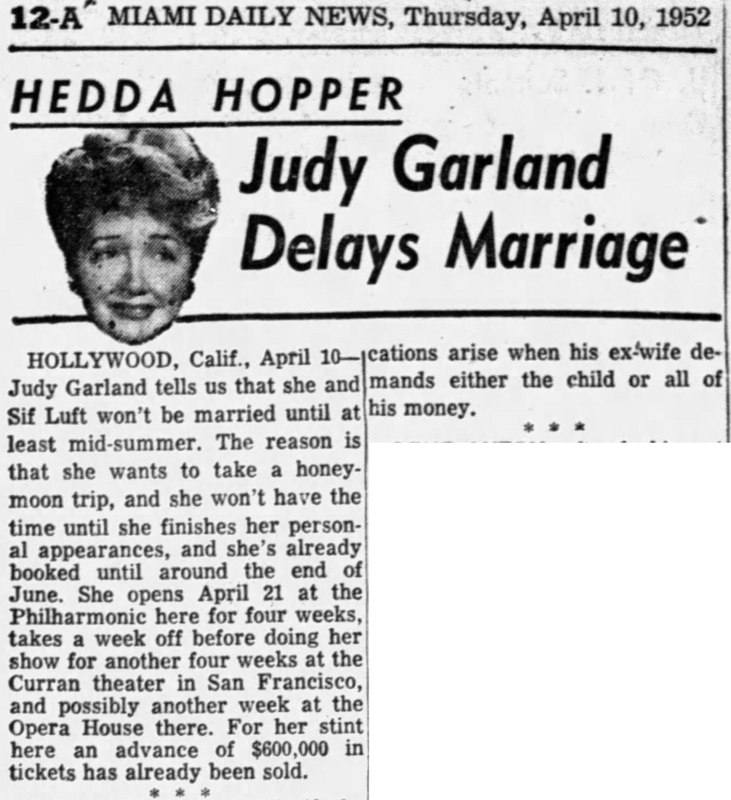 Tome called: 10:30 a.m.; Judy arrived at 11:15 a.m.; dismissed: 4:30 p.m.
April 10, 1944: Judy had dubbing work for Meet Me In St. Louis. Time called: 10:00 a.m.; dismissed: 12:30 p.m. This was Judy’s second to last day of work on the film. The final day was another day of dubbing on May 26, 1944. Photo: 1983 VideoDisc cover artwork. April 10, 1945: Judy and co-star John Hodiak were on location in Chatsworth, California in the San Fernando Valley, filming desert scenes for The Harvey Girls including the ultimately deleted song “My Intuition.” Time called: 10 a.m.; arrived: 10:15 a.ma; dismissed: 5:35 p.m. Check out The Judy Room’s Filmography Page on The Harvey Girls here. 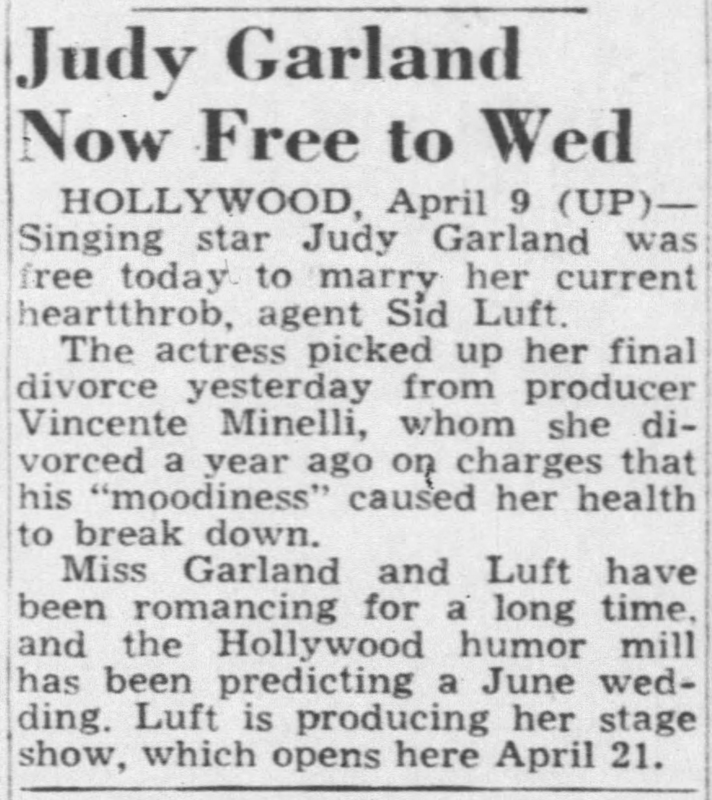 April 10, 1947: Another famous Garland outtake was pre-recorded on this day, “Voodoo” for The Pirate. 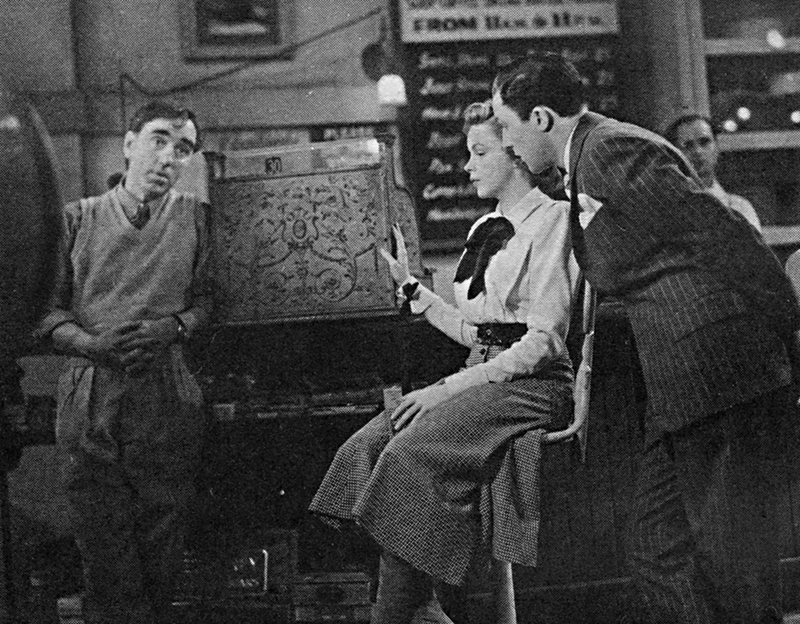 The song went through various takes but was ultimately deleted after filming. The footage no longer survives. 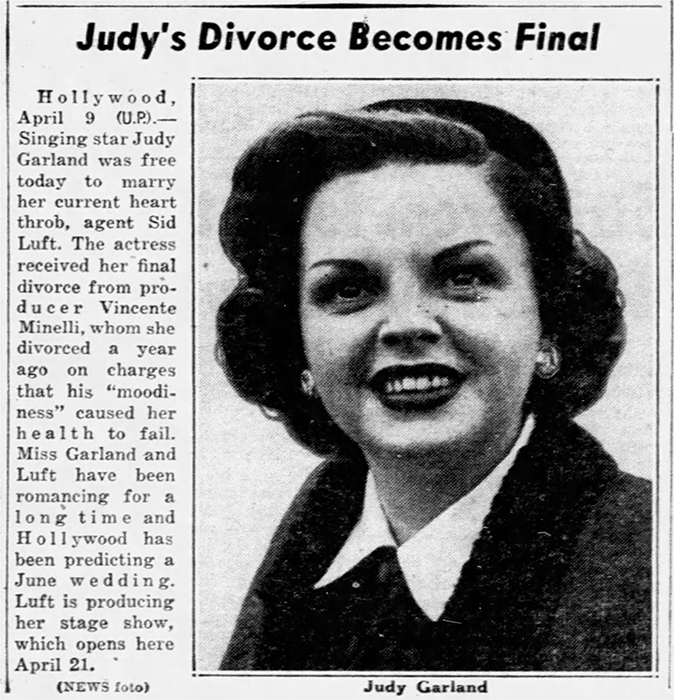 Time called: 12 p.m.; dismissed: 5 p.m.
Also on April 10, 1947: Borrow Judy Garland’s Beauty Secret! 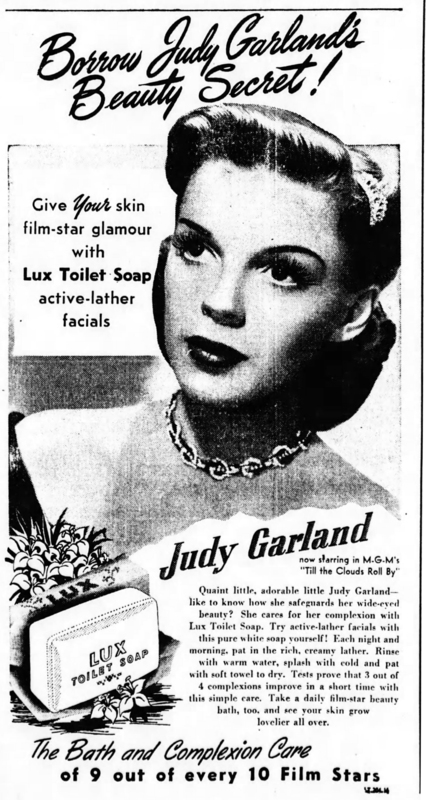 This Lux Soap ad promoted their product as a tie-in to the recent MGM musical hit Till The Clouds Roll By in which Judy’s guest star appearance as Marilyn Miller was the highlight. 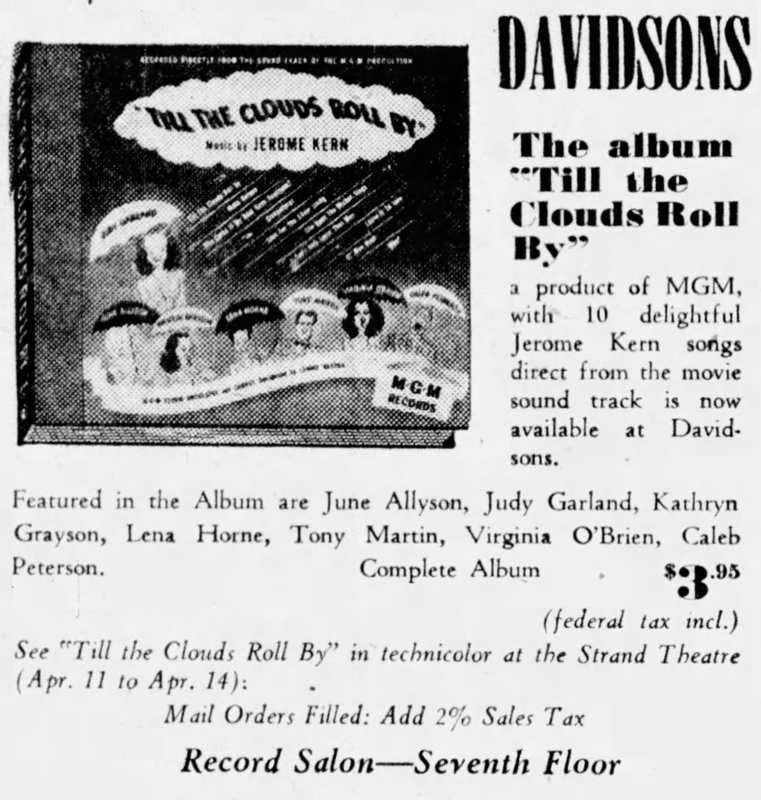 Meanwhile, the newly formed MGM Records had just released (on March 1st) their first album, “MGM-1,” which was the soundtrack to Till The Clouds Roll By. 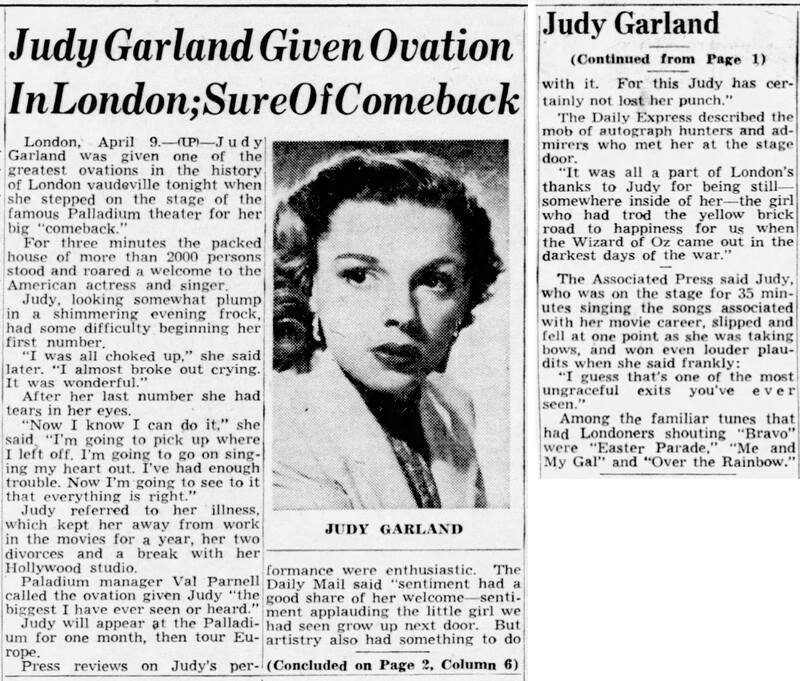 April 10, 1951: The reviews were in and Judy was the talk of the entertainment world with her smashing success on her opening night at the London Palladium the previous night. What would become known as her legendary “Concert Years” had begun. 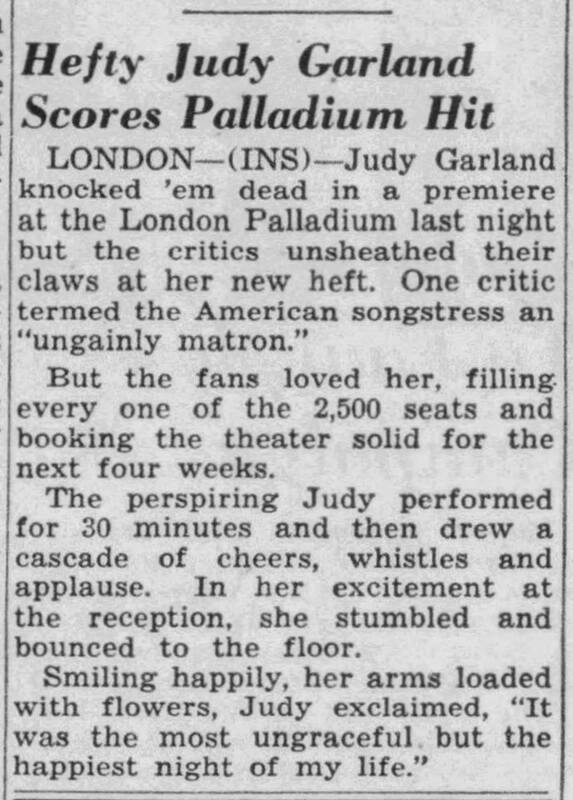 Note how the articles mention Judy’s weight with words like “heavyweight” “plump” and “ungainly matron.” That didn’t stop the critics from giving her stellar reviews, of course, but one wonders what these words did for Judy’s self-confidence if she read them. 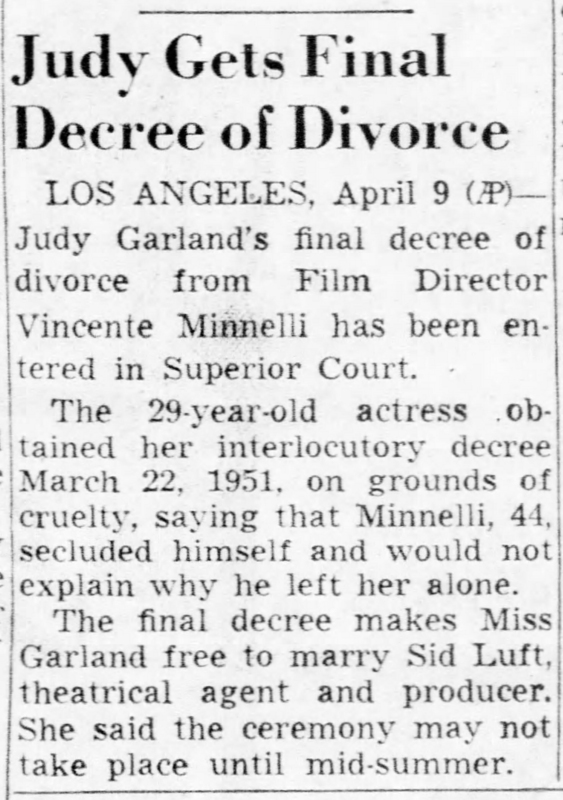 April 10, 1952: Judy’s divorce from her second husband, Vincente Minnelli, was reported and being finalized on April 9th. This left her open to marrying Sid Luft. Photo: 1984 laserdisc cover artwork. 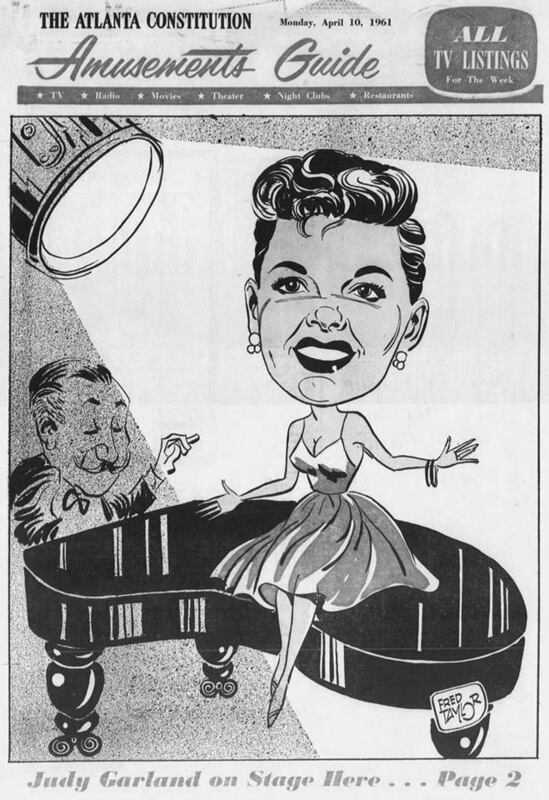 April 10, 1961: The Atlanta Constitution ran this great artwork promoting Judy’s upcoming concert at the Municipal Auditorium on April 13. 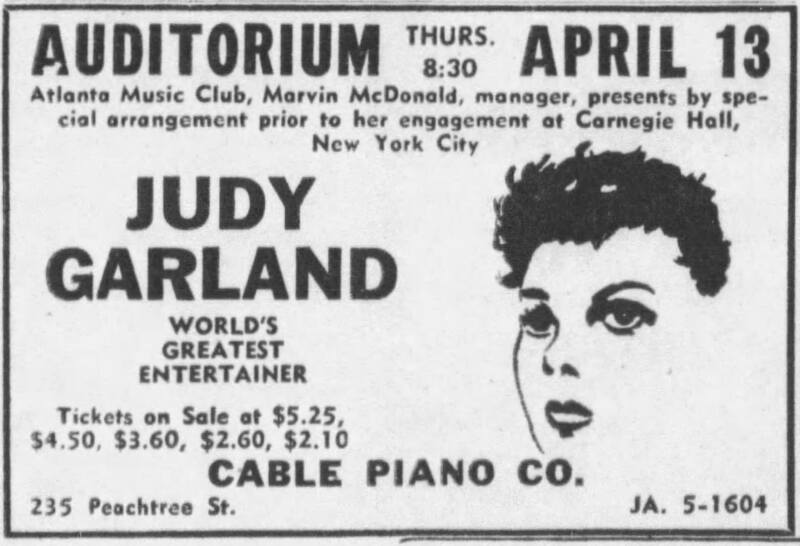 The concert was part of Judy’s big 1961 tour, the apex of which was her legendary appearance at New York’s Carnegie Hall on April 23rd. 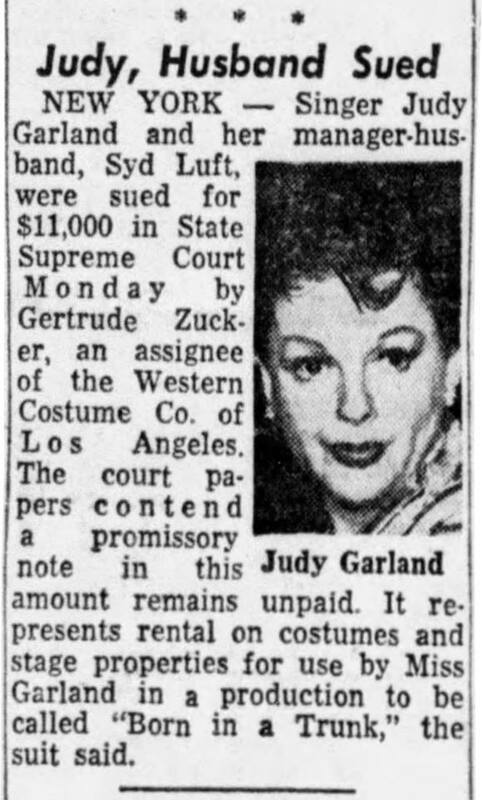 Also on April 10, 1961: Judy and husband Sid Luft were sued by the Western Costume Company for $11,000. The suit was actually filed the day before, on April 9th, and hit the news the following day. 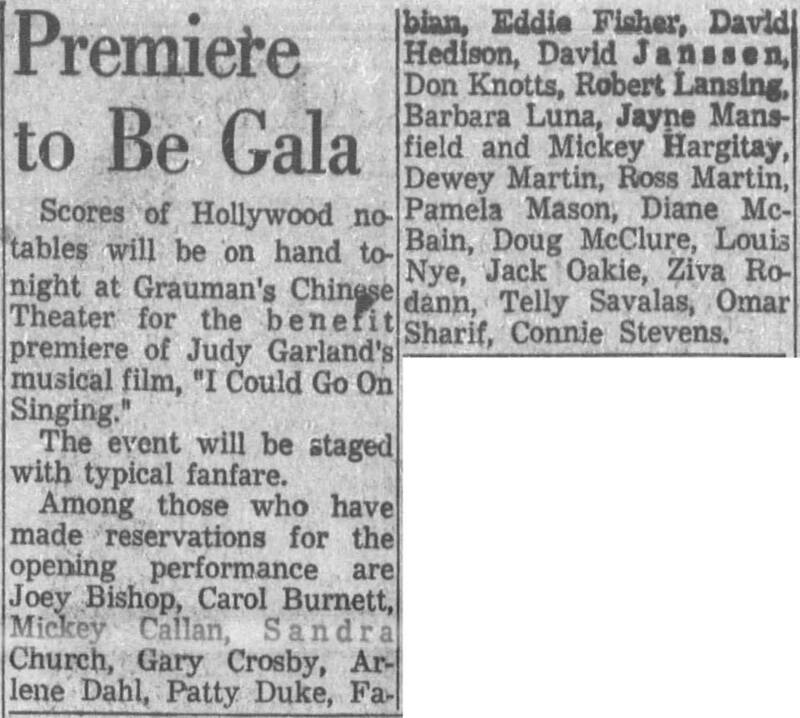 April 10, 1963: The Hollywood premiere of Judy’s recent film, I Could Go On Singing, took place at Grauman’s Chinese Theater in Hollywood. The event was a benefit for handicapped children. Judy was in New York at the time so she did not attend. 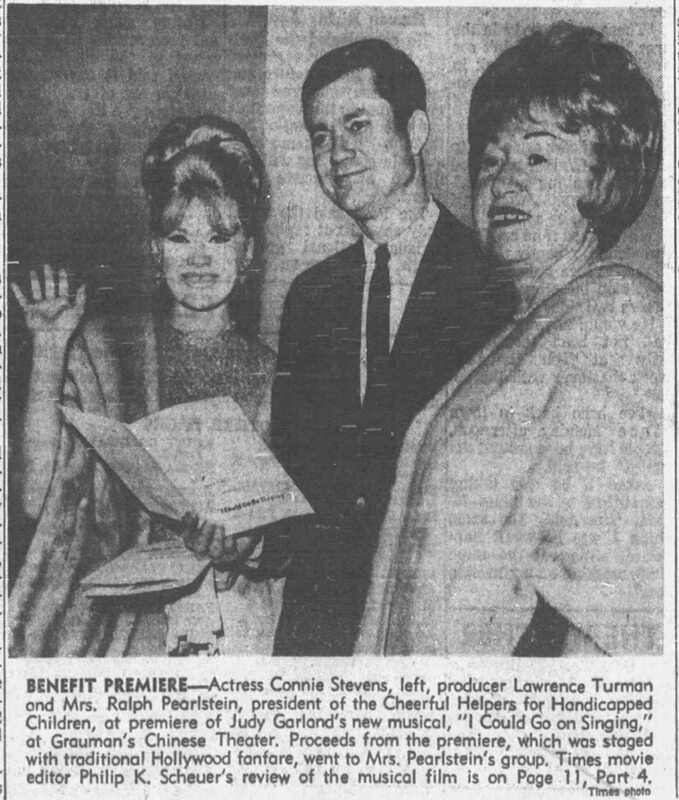 April 10, 1964: Judy wrote checks to Lionel Doman (her butler) for $115.64, and to the Palisade Travel Bureau, 15235 Sunset Blvd., Pacific Palisades, California, for $213.90. Delighted to see the daily music report for the Voodoo number. Thanks Scott! I must confess – I’ve developed a fascination with the MGM recording scene numbers (possible due to my passion for math and statistics!). Would you be so kind as to shed light on the following questions? 1. What Wizard of Oz scoring recordings were assigned scene numbers 2512 as well as 2526 through to 2524 (these recordings were not included on any Wizard of Oz laserdiscs nor DVDs – hopefully Warner Bros will release them for the film’s 80th anniversary). 2. 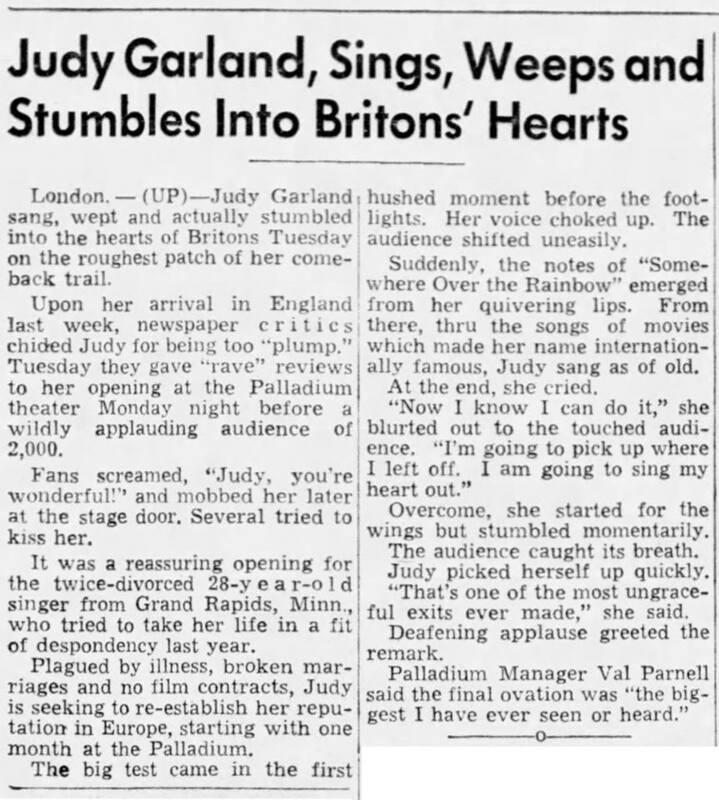 Did Judy actually re-record Over the Bannister on May 26, 1944? She pre-recorded it on Nov 3 (according to the daily music report on that day’s entry), but Scott’s book says she recorded it during the May 26 scoring session? What post-scoring scene number was assigned to this possible re-recording? Better still, could you please post the scoring sessions for St. Louis for May 25 through to May 27, 1944? I wonder if other scoring tracks were recorded that never made actually it into the film or are still yet to be released by Warners Bros.
Forgive me for my curiosity – it gets the better of me sometimes! I’ll have to get back to you on the Oz sessions (it’s early here and I’m on my way to work). 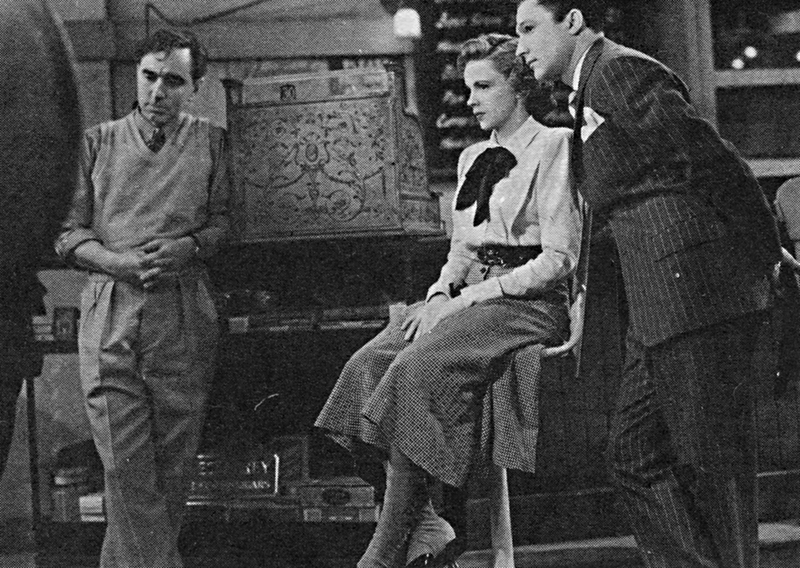 Regarding Oz: 2512 was “Reel 4 “The Great Wizard (wild)” 10-second underscoring, part of a big session on April 13, 1939. 2525 was “Main Title” Chorus with orchestra, recorded on May 6, 1939. 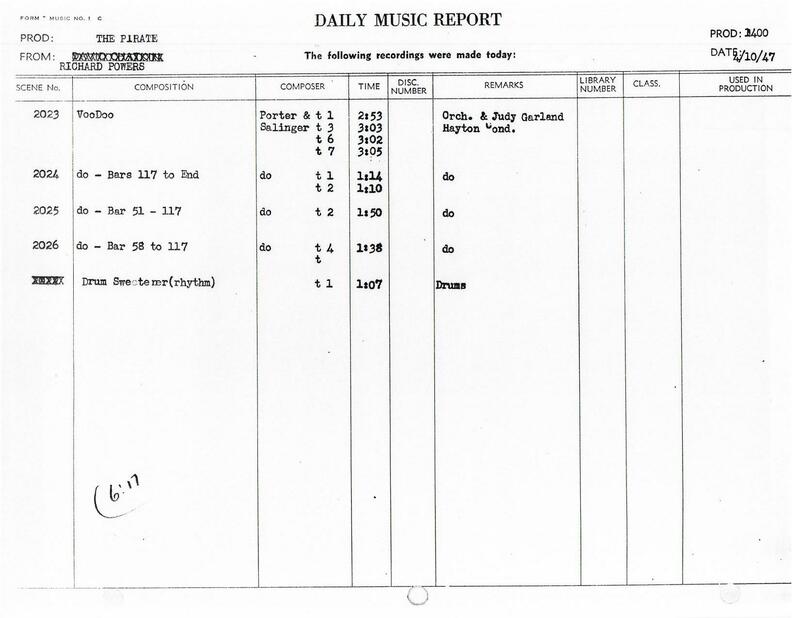 That was the first recording of a long day (apparently) that resulted in three pages worth of Daily Music Reports. Scene number 2525 through 2550 were recorded on this day and include most of the underscoring included on the laserdisc, CD set, and subsequent DVD releases (everything from the Main Title to Cyclone to March of the Winkies to Toto Brings News and much more. Thanks for your reply. What work do you do? I’m a full-time PhD student – long days, long nights, and never a dull moment! 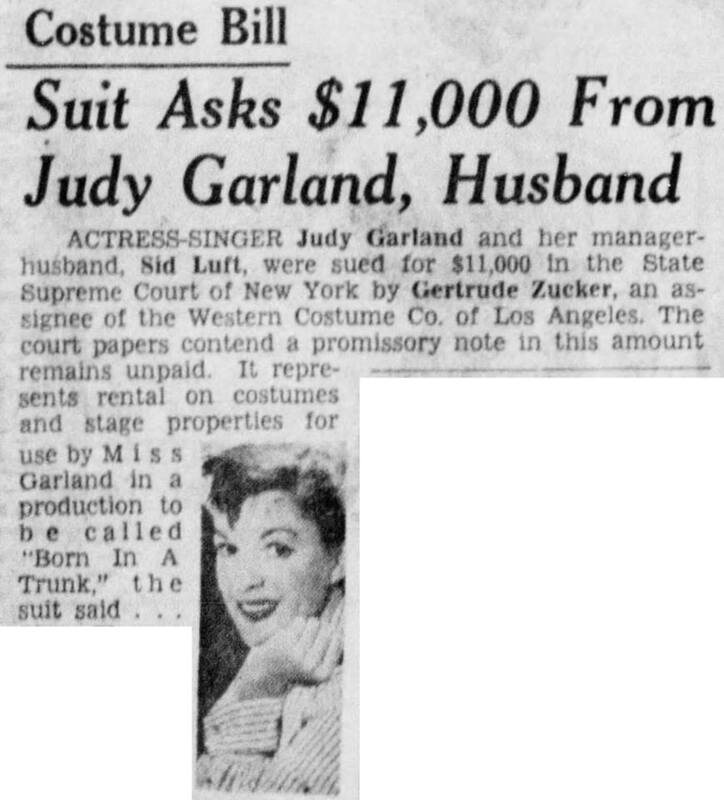 Reading, watching, and listening to Judy (and Judy-related) material gives me a great excuse to break away from my research every now and then! I made a small typo in the second part of my Oz question. It should have read, “Which scoring session recordings were assigned scene numbers 2516 through to 2524?” I don’t think these were included on the laserdiscs and DVD releases, nor was scene 2550. It will be interesting to know what these recordings were. Regarding the St. Louis question, thanks for clarifying. I really hope you end up posting those scoring session reports (whenever you have time, of course). In the meantime – to satisfy my curiosity – could you please tell me which St. Louis scoring recordings were assigned scene numbers 2501 through to 2510? PS – Congrats on going to your PhD. That’s amazing! I wish you all the luck in the world. It’s worth all the long days and nights!